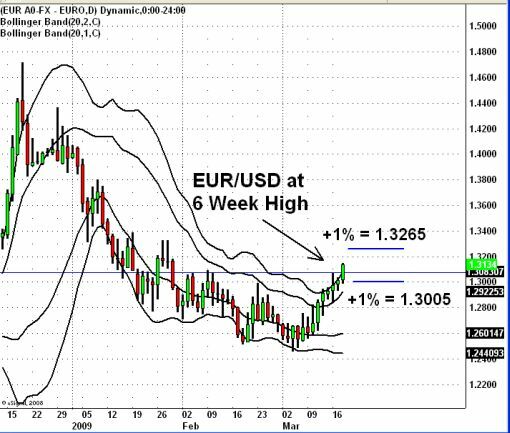 The Euro has surged to 1.3157, a six week high against the U.S. dollar. The currency pair’s strength is a big departure from the price action of the other majors currencies this morning, which have weakened across the board. The break of the old highs opens the door for a move above the January highs of 1.33. The FOMC rate decision will determine the next 1 percent move in the EUR/USD. Remember, if the FOMC fails to make any new announcements, the dollar should rally, equities should sell off and bond prices should rise. If they make the nuclear announcement of buying long term U.S. Treasuries, the dollar should sell off, equities should rally and bond yields should rise. For a more in depth outlook on the FOMC rate decision, read my FOMC Preview. ← How Has the Economy Fared Since the Last FOMC Meeting?